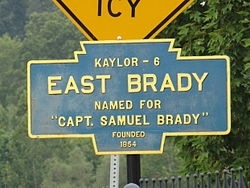 East Brady is named after Captain Samuel Brady, who fought with Native Americans at that location. Captain Brady (1756-1795) was a frontier scout and the subject of many legends in the history of western Pennsylvania and northeastern Ohio. He is best know for jumping across a gorge over the Cuyahoga River to escape pursuing Indians in what is present day Kent, Ohio. This jump is still remembered as "Brady's Leap". Graham Field was originally part of the estate of a noted East Brady businessman and delegate to the 1904 Republican National Convention. Newton Graham and his family generously donated this valuable piece of land, which is located along the Allegheny River, to the East Brady community. Graham Field is an athletic complex consisting of football and baseball fields, tennis courts, and a playground. It was the home of the East Brady High School Bulldogs for many years and was witness to many epic battles on the gridiron when the Bulldogs participated in the PIAA Little 12 Football Conference.